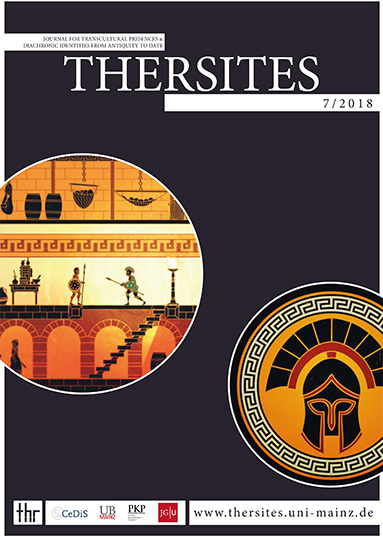 thersites is an international open access journal for innovative transdisciplinary classical studies edited by Christine Walde, Annemarie Ambühl, Filippo Carlà-Uhink and Christian Rollinger. thersites expands classical reception studies by publishing original scholarship free of charge and by reflecting on Greco-Roman antiquity as present phenomenon and diachronic culture that is part of today’s transcultural and highly diverse world. Antiquity, in our understanding, does not merely belong to the past, but is always experienced and engaged in the present. thersites contributes to the critical review on methods, theories, approaches and subjects in classical scholarship, which currently seems to be awkwardly divided between traditional perspectives and cultural turns. thersites brings together scholars, writers, essayists, artists and all kinds of agents in the culture industry to get a better understanding of how antiquity constitutes a part of today’s culture and (trans-)forms our present.